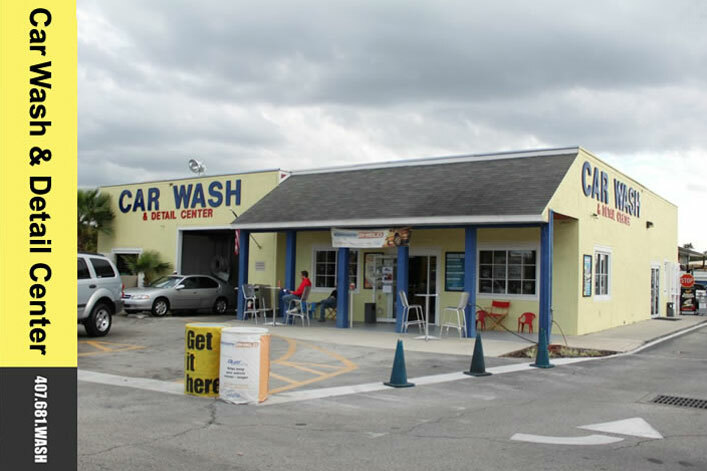 Soapy Fresh Water Car Wash including choice of Rain-X or Element Shield Total Vehicle Protection, Undercarriage Rinse, Rim Cleaner, & Tire Shine, Interior Vacuum, Dash & Console Cleaned & Conditioned, Doors Cleaned, Windows Cleaned Inside & Out, Door Jambs Cleaned, Air Freshener Added. 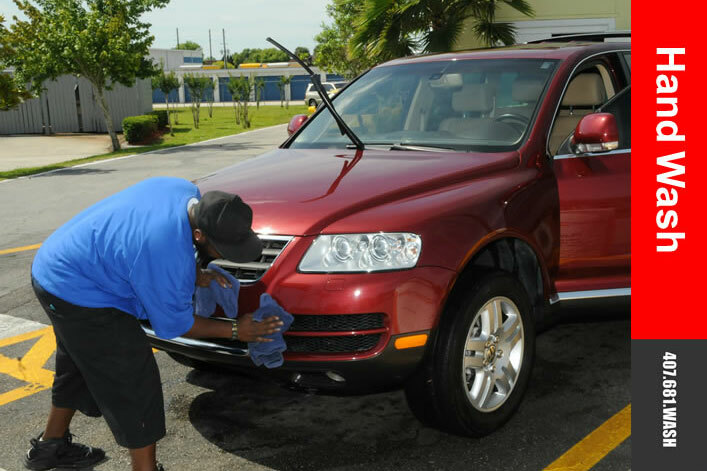 Soapy Fresh Water Car Wash including Conditioning Foam & Clear Coat Shine, Undercarriage Rinse, Rim Cleaner, & Tire Shine, Interior Vacuum, Dash & Console Cleaned & Conditioned, Windows Cleaned Inside & Out, Door Jambs Cleaned, Air Freshener Added. Soapy Fresh Water Car Wash including Conditioning Foam, Undercarriage Rinse, Rim Cleaner, & Tire Shine, Interior Vacuum, Dash & Console Wiped Down, Windows Cleaned Inside & Out, Door Jambs Cleaned. 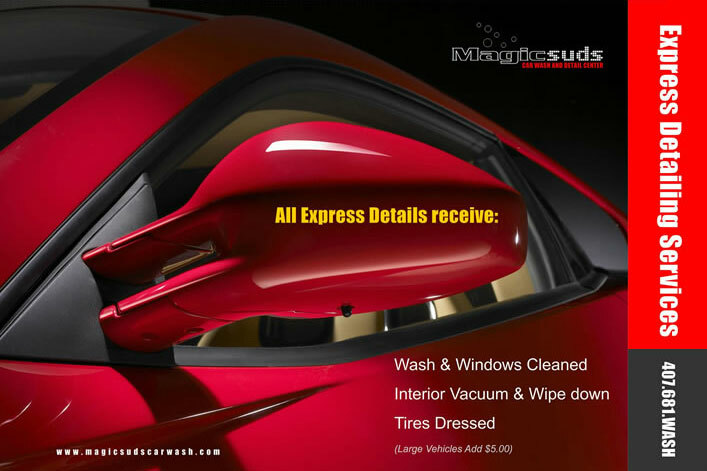 Soapy Fresh Water Car Wash, Interior Vacuum, Windows Cleaned Inside & Out, Door Jambs Cleaned. Soapy Fresh Water Car Wash including choice of Rain-X or Element Shield Total Vehicle Protectant, Undercarriage Rinse, Rim Cleaner, Tire Shine, Door Jambs Wiped. Soapy Fresh Water Car Wash including Conditioning Foam & Clear Coat Shine, Undercarriage Rinse, Rim Cleaner, & Tire Shine, Windows Cleaned Outside. Soapy Fresh Water Car Wash & Towel Dry. All exterior of vehicles’ painted surface washed & Cleaned then hand waxed using synthetic Nano wax or Meguiar’s Products. Complete Interior Air Purged, Including All the Nooks & Crannies, & Crevices, In-between and Under the Seats, Steering Column, Gear Shift, Cup Holders Etc. Complete Interior Trim Cleaned & Conditioned. Windows Cleaned Inside & Out, Door Jambs Cleaned. Platinum wash service and Towel Dry, Rim Cleaner, & Tire Shine. Carpets and mats shampooed – removing oil, grease and deeply embedded dirt; Platinum wash service, tires dressed, dash conditioned air freshener added. Then the 2-step process to protect your vehicle begins. First, a cleaner wax is used to remove any old wax, minor oxidation and/or any foreign substance including Scuff Marks. Your Vehicles’ interior is then conditioned, windows cleaned inside & out, air freshener is added. • Wash and Wax • Interior Super clean • Express Carpet Shampoo • Seats Cleaned & Conditioned • Odor Eliminator. Interior restored to the best possible condition. interior surface cleaned and conditioned. Exterior trim, dash and tires conditioned. doors and console cleaned and conditioned. 2 coats of pure Ivory Carnauba wax. 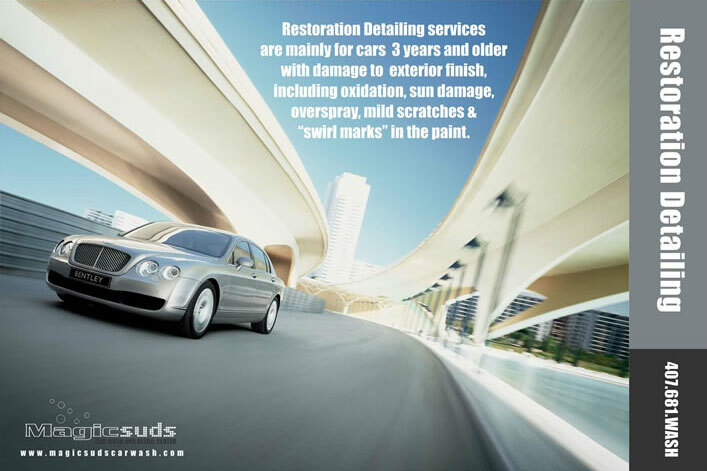 Allow 4.5 hours for curing time buffing or claying may be needed for an additional charge. (not a fan of your car being machine washed?